The first Air BP Sterling Pilot Scholarship, which was launched in January 2015 to assist an aspiring UK-based pilot with little or no experience of flying to achieve a Private Pilots Licence (PPL), has been awarded to Alex May. The scholarship will enable the 19-year-old Air Cadet from Hartlepool to complete his PPL Training and pursue his aim of becoming a commercial pilot with a major airline. Gaining his PPL is a pre-requisite for Alex to take up his place in September on a BSc in Professional Aviation and Pilot Practice run by Tayside Aviation. The course which is run in conjunction with Middlesex University concludes with a work placement at Logan Air. Alex had accrued 22 hours towards his PPL but lacked the funding to complete the required minimum of 45 hours. The Scholarship provides a grant valued at up to £10,000 towards the cost of Alex’s flying training and examination costs. On becoming the first Air BP Sterling Pilot Scholar, Alex said, “I am very grateful to Air BP. The award is one of the most meaningful things to have ever happened to me. It has allowed me to complete my PPL, which is a key stepping stone towards becoming a commercial pilot. My ultimate goal is to fly for one of the larger airlines”, said Alex. “I am also grateful to The Air Cadets who sparked my enthusiasm for flying and also prepared me in theory, which is useful for my degree”. 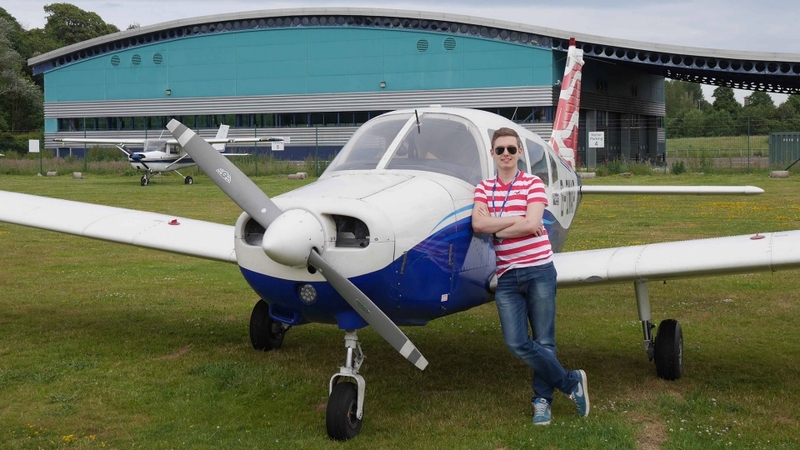 Regarding the financial challenges faced by aspiring pilots, Alex comments, “Having to first gain your PPL for my course ensures you have the aptitude before committing to a degree costing about £75,000. Now that you can do pilot training as a degree it has made Student Finance Loans available to cover about a third of the cost. It helps as banks are reluctant to lend the full amount. This is why scholarships such as Air BP’s are so important in bridging the funding gaps”. The future availability of qualified pilots is a growing concern for airlines and air operators. Alex comments, “Airlines such as BA and Virgin have introduced new CPL-based training programmes but one benefit of my course is a PPL gives you single engine training, which opens up opportunities in General Aviation too”. “We congratulate Alex May on becoming a highly deserving first Air BP Sterling Pilot Scholar. We are delighted that our contribution has made the difference to Alex completing his PPL and helping him take the first step towards a career in aviation”, said Mark Atherton, Air BP’s General Aviation Sales & Marketing Manager, Western Europe. “Air BP is committed to supporting young aspiring pilots who want to build a career in aviation, and to contributing to the wider aviation community. We see our responsibility extending to supporting all areas of aviation, the supply of future pilots, as well as to providing a reliable supply of quality fuel”. Air BP worked with the Honourable Company of Air Pilots, formerly known as The Guild of Air Pilots and Air Navigators (GAPAN), to organise the Air BP Sterling Pilot Scholarship because of its excellence in promoting the availability of scholarships to a wide public audience and conducting a rigorous and fair selection process. It was on the recommendation of an instructor at Tayside Aviation that Alex approached the Honourable Company of Air Pilots.